In his interview published under the title The Power of Myth, Bill Moyers voiced the popular idea that myths are an ancient (and largely discredited) means whereby human beings have searched for the meaning of life. Campbell’s remark ran counter to a strong twentieth-century assumption widespread in Western culture, which had found a strong advocate in the Nazi death camp survivor and psychiatrist Viktor Frankl. Frankl’s best-seller Man’s Search for Meaning (1946) argued that our most pressing pursuit is a meaning that will make life worth living. He was joined in this belief by the likes of the theologian Paul Tillich who analyzed our modern condition as suffering from a profound sense of meaninglessness and existential despair. So when Campbell challenged Moyers’ assumption regarding the priority of meaning, and proposed instead that our true and deepest yearning is for an experience of being alive, he was making a rather revolutionary claim. But we misunderstand him if we take him to say that meaning doesn’t matter. His entire scholarly career was devoted to interpreting the great myths, symbols, and rituals by which humans have made life meaningful, an interest that had grasped him already when he first visited a museum as a young boy. Since watching The Power of Myth interview years ago and subsequently diving into Campbell’s works, I’ve come to appreciate his views on meaning and life through the lens of constructivism. My diagram will serve to illustrate what I think he meant and how it applies not just to a phenomenology of myth but to every construction of meaning. A looping dashed orange line divides my diagram into two distinct ‘realms’: one above the line and inside its loop; another below the line and outside its loop. The loop itself contains a stained-glass design – articulated, rational, and translucent shapes are joined contiguously to form a more general pattern representing the meaning of life. Living individuals are more or less engaged in the work of constructing meaning, and their collective effort is projected outward as a shared world. This world of meaning does not exist apart from the minds that construct it. They project it out and around themselves, and then proceed to take up residence inside it. Tradition thus opens a channel to the remote and even primordial past where, unsurprisingly, the mythological warrants of authority are anchored. A common impression, therefore, is that the meaning of life is predetermined and revealed to us from beyond. Since transcendent authority speaks from an inaccessible (sacred) past and from an inaccessible (heavenly) realm, we must rely on those preserved revelations – or at least that’s how the game is spun to insiders. Meaning is constructed, then projected, and finally locked in place. Viola. So Frankl and others were correct: humans do indeed search for meaning. But that’s only because we have accepted the self-protective doctrine of ideology which says that meaning is out there, independent of our minds, already decided, just awaiting our discovery and consent. For its part, constructivism doesn’t claim that meaning is merely optional. Quite the contrary, humans need meaning to the extent that we cannot be happy, sane, or self-actualized without it. But should we get stuck inside our own constructs of meaning, forgetting how we got there and losing any sense of reality outside our meanings, that box quickly becomes too small for our spirit and the meaning of life drains away. In that great project of meaning-making known as mythology (and its associated world constructs) we can find an acknowledgment of this limit in the narrative mechanism of apocalypse. Whether depicted as a final catastrophe that will bring down the current world-order, or more subtly in the deity whose true nature is said to surpass our comprehension, the storyteller (or myth-maker) encodes a recognition of meaning as only the representation of what cannot be grasped by our mind. At crucial moments, the constructed veil of meaning must be pulled aside to reveal the present mystery of reality. This realization in myth is illustrated in my diagram where the looping line crosses over itself and breaks through to a realm below and outside the loop. Here the meaning of life dissolves into a grounded experience of being alive. I call the experience grounded to make the point that such a breakthrough is from (i.e., out of) our constructs and into the naked Now, out of our world and into the present mystery, out of meaning and into a Real Presence which is indescribably perfect – and perfectly meaningless. 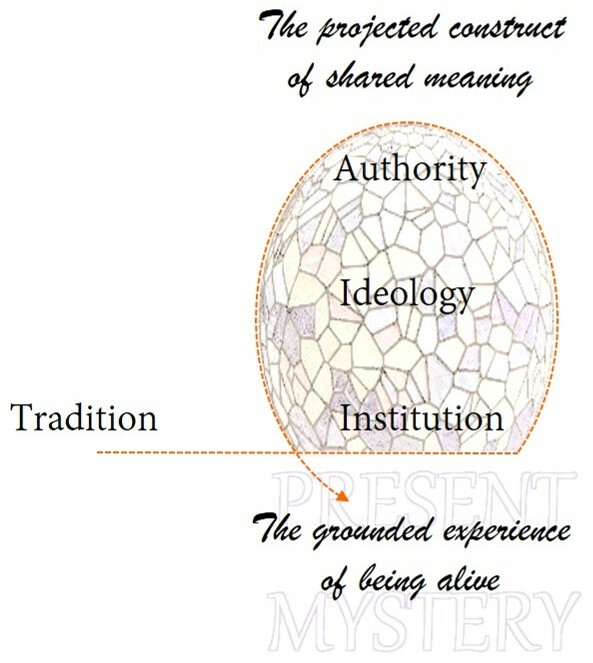 Just as our projected construct of shared meaning entails a separation of mind from reality, mediated by its constructed representations, the return to a grounded experience of being alive is not a rational maneuver but instead transpires as a genuine rapture in Campbell’s sense above. We are overtaken and transported, as it were, to a place outside the ego and its constructed identity. Of course this is not ‘somewhere else’, but rather nowhere at all. It is the Now/Here. As I have tried to make clear in other posts on this topic, such a breakthrough to the rapture of being alive is not a one-time achievement. Nor does it release us of the need to be actively engaged in the ongoing construction of meaning. What it does make possible is a higher consciousness of our own creative authority, along with a humble admission that the best product of our efforts – the purest and most inspired expression of meaning – will be only and always an understatement. Back in the late 1980s Bill Moyers conducted a long interview with the scholar of world mythology Joseph Campbell, published under the title The Power of Myth. In their conversation Campbell invoked the up-and-coming personal computer as a metaphor for understanding myth and religion. Campbell suggested that we might think of the various religions as different software applications, all supported by an underlying operating system but programmed to accomplish distinct aims. 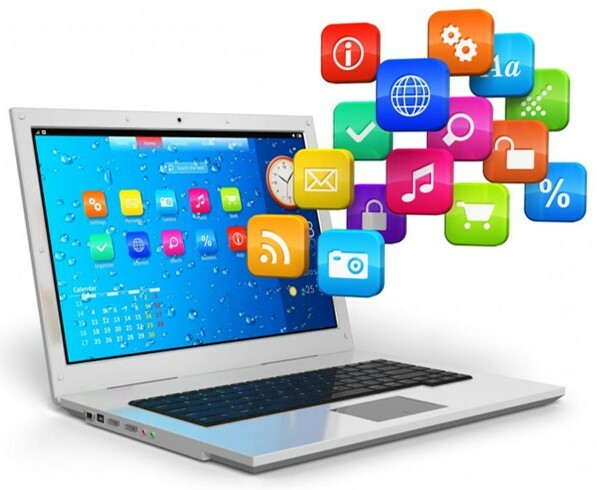 On your personal or workplace computer you probably have numerous applications, some of which you use on a daily basis and others less often. A few of them are designed for work productivity, while others are used for creative design or entertainment. You probably have favorites among them. These are probably the ones you feel most confident and comfortable in using. The other less familiar applications are sitting there occupying space on your hard drive or in the cloud, and your relative lack of competency when it comes to them might motivate you to simply remove their icons from the desktop. Out of sight, out of mind – and no reminders of what you don’t know. Just because you use one software application more than the rest and are most fluent with it, you probably like it more. If two programs do similar things but one fits your habits and preferences better than the other, you might try to get it to do things it wasn’t really designed for. Are you ready to say that this one application is ‘right’ and the others are ‘wrong’? That it’s ‘true’ while the others are ‘false’? Likely not, or else you would be willing to admit that your opinion is more about personal taste. Among the religions, one ‘application’ is programmed to connect you with your community and its tradition, whereas another is designed to separate you from the conventions of society and prepare you for the next life. A third type of religious software is a set of commands to help you descend the roots of consciousness to the ground of being-itself, while a fourth offers a program for prosperity in this life. Just among these four applications – and you should recognize in my descriptions a sampling from actual religions today – you probably regard one as better than the others, as more ‘right’ and ‘true’. But of course, that would be more a commentary on your comfort, fluency, and personal preference than an objective statement about the others, or about religion itself. Following the etymology of the word “religion” (from the Latin religare, to link back or reconnect) Campbell believed that each religion can be true in two senses: (1) according to how effective it is in helping us accomplish our aims (e.g., tribal solidarity, heavenly hope, mystical union, or worldly success), and (2) the degree of fidelity it has with the ‘operating system’ of our deeper spiritual intelligence as human beings. In fact, nearly all religions place value on the four aims just mentioned, differing with respect to which aim gets the strongest accent. A more crucial question has to do with fidelity, with how strong and clear is the signal by which a particular religion reveals to us the present mystery of reality, our place in the universe, and the emergent thresholds of our own evolving nature. On this question it might score very low. Ironically it is often the accented factor in the individual application that eclipses and draws focus away from this universal dimension. Devotees seek to make the local accent into an exclusive virtue, and then promote it to the world as ‘the only way’ of salvation. If you were to keep your favorite application always running on your computer, eventually it would get slower and less efficient in what it was designed to do. The same is true of the religions: When devotees obsess over that singular aim and absolute truth, with time their religion gets hung up in redundancies and delays and may even ‘freeze up’ or ‘crash’. This is typically when religion undergoes a fundamentalist regression: the frustration to ‘make it work’ (or believe it anyway) doubles down aggressively and starts enforcing a mandatory compliance among its members. The organizational distinction between the insider faithful and outsider nonbelievers gets further divided on the inside between nominal believers (by name only) and the ‘true believers’. Fundamentalism, then, is not the advancement of a religion’s primary aim but a regressive collapse into emotionally driven dogmatism; a loss of faith, not its fulfillment. Because it’s so easy and common for religions to get fixated on what makes them special (i.e., different from others), it is also common for them to lose their roots in the deeper operating system of spirituality. Meditation, mindfulness, quiet solitude, and contemplative presence are spiritual practices that tend to get downplayed and forgotten – but the consequences of this neglect are significant. When it comes to the maintenance of technology, we understand the importance of periodically refreshing the screen, clearing the cache and clipboard, occasionally closing applications, and restarting our computer. As it powers on again, the support for our programs is more robust and the applications themselves work more efficiently. The synchrony of our software and the deeper operating system has been restored. Things just tend to go better when we take time to refresh and restart. As an advocate for post-theism I give frequent attention to the question of how it differs from theism. I’ve made the point that the “post” in post-theism should not be interpreted to mean that theism is being left behind for a more preferable secular atheism. Whereas atheism takes its very existence from the debate over whether or not god is to be taken literally, post-theism (at least the variant of post-theism I’m interested in promoting) presses beyond the debate to consider how our representations of god in art, story, and theology either support or arrest our spiritual evolution. Central to my argument is the claim that a distinct concept of god, personified in myth as one who watches over and provides for us in exchange for our worship and obedience, is not only conducive to our moral development (and therefore in the interest of our tribe as well) but also awakens in us the higher virtues of compassion, responsibility, benevolence, and forgiveness. A longitudinal review of a religion’s mythology (i.e., its library of sacred stories) reveals an unmistakable development of its principal literary figure (i.e., the deity) in this same direction. In other words, the mythological god sets before the community a moral exemplar and stimulant to what we are in the process of becoming. And whence do these stories arise? Do they come to us by a vertical drop out of heaven or from a period in history when people actually witnessed metaphysical realities, supernatural interventions, and miraculous events? This search for origins and evidence is really exposing the fact that the stories have already lost their power. When multiple narratives cross and weave the very fabric of your worldview, the literary god who lives in the stories functions as a causal agent in the way everything holds together. Once the background assumptions in the myth lose currency, however, or fall out of alignment with present-day theories of the universe, the literal existence of that god suddenly becomes a question for debate. Because we have lost (or outgrown) our ability to simply inhabit our stories and engage the god who lives in them, the only way theism can hold on is by insisting that its myths are not myths at all, but rather factual reports of things long ago, far ahead, or otherwise outside the world in which we live. So you have no choice but to either take it literally, as orthodoxy requires, or else toss it all on the pile of outdated cultural junk. Post-theism, on the other hand, encourages a fresh exploration of myth and its resident deity. But rather than reducing mythology to the stories different tribes tell about their gods (comprising the various religions), it insists that we not leave out of consideration the third component of theism, ego, around whose evolutionary destiny this whole thing turns. Beyond being a mechanism of societal cohesion and control, theistic religion has our individual formation, awakening, liberty, and transcendence at heart – at least this is what I aim to show. Let’s track the hero adventure of this quirky social construct of identity known as ego (or “I”). Depending on where in this adventure we decide to insert ourselves for a look, everything, from its internal state and sense of self, its dependency and regard for others, its perception of time, and its mental model of reality as a whole, will be construed according to a few basic energizing concerns. These concerns are, we might say, the pressure points where individual consciousness confronts reality with its most urgent and timely need. I see these as formative periods when the linkage (religare again) of consciousness to reality is having to be renegotiated, in the passage through self-consciousness and into what lies beyond. For the sake of simplicity, I will focus on just three such formative periods. It seems to me that these three stages of transformation provide a way of viewing ego development as consisting of trimesters (though not all of equal duration) and culminating in the transition of consciousness to the more spiritually grounded (and selfless) experience we call soul. The transpersonal psychologist Stanislav Grof has conducted a lot of research into the basic images, metaphors, and mythic themes that inform non-ordinary states of consciousness. Particularly intriguing are the deep and universal images with roots in our pre-personal memories of our mother’s womb and the birth experience. 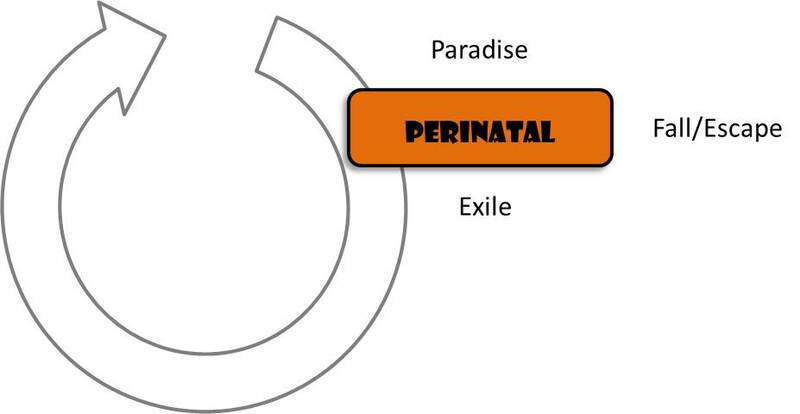 A kind of paradisal garden prevailed in utero where the biological requirements of our body were instantaneously met. In that environment our consciousness registered a feeling of undifferentiated oneness, blissfully absent the pang of need. Then the time came for our “eviction.” The walls around us began to contract and we were forced down a narrow passage with no foreseeable exit. 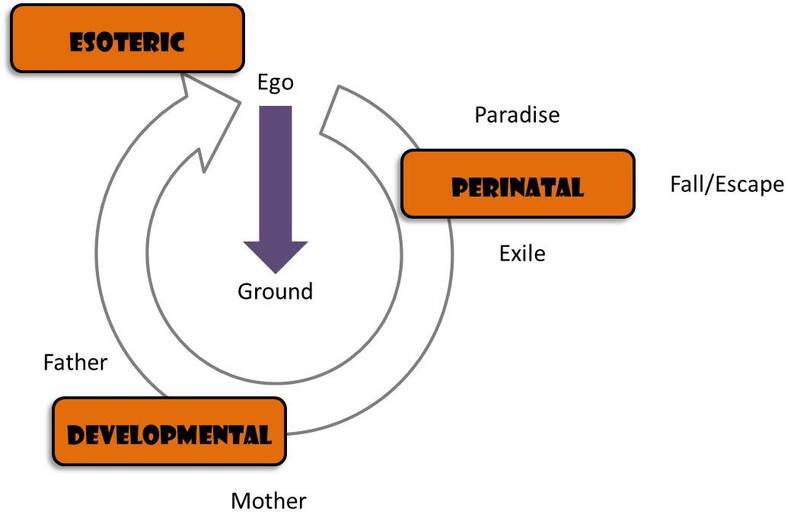 We know from obstetrics that the birth experience is stressful on a fetus: falling out of the bliss state and down a constricting tunnel constitutes, following Grof’s theory, our first experience of trauma as a human being. Occasionally the birth canal and pelvic girdle of the mother are such that a safe passage is difficult or even impossible, which amplifies the distress considerably. The light at the end of the tunnel introduces the newborn to a strange reality, very different from the one left behind. Instead of an oceanic state of warm satisfied comfort, the infant is jostled about in a dizzying kaleidoscope of flashes, shadows, and odd shapes, accompanied by the intrusion of harsh sounds and fluctuating temperatures. For the first time, need forces itself into consciousness with the inaugural gasp for air and sharp pangs of hunger. This is definitely “east of Eden,” the beginning of life in exile. When we look out across the mythology of world religions, this pattern of Bliss-Fall-Exile starts showing up everywhere. Even when we survey the so-called secular literature of poetry, novels, and even non-fiction writing, this same archetype of a three-part transition into a state of separation and loss (along with a longing to return to “the way it used to be”) is remarkably widespread. The reason is that this archetype – this “first form” or primal pattern – is really down there, in the earliest strata of our perinatal memory. 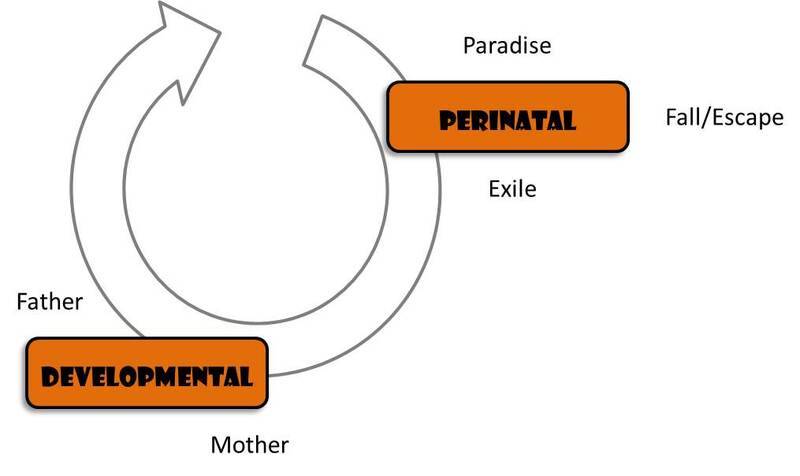 Following our expulsion from Eden and finding ourselves in exile, our next challenge involved two more archetypes – Mother and Father. While for many of us these terms match up to our actual biological parents, this isn’t necessarily the case. “Mother” names the provident power in whom we found nourishment, comfort, warmth, and emotional bonding. She was our secure base, the one place we could go for the reassurance that “all is well.” Our first attachment (after the Fall) was to Mother, and she provided the safe place where we could simply relax into being. “Father,” contrastingly, was our first Other, whose presence was as an Outsider. His existence called to us from across a chasm of otherness and issued the challenge to step out into our own developing individuality. The secure base represented in the enveloping embrace of Mother needed to be left behind, if only momentarily, in order to prove ourselves capable and worthy of recognition. Father was the pat on the back when we succeeded in a task, as well as the voice who encouraged us to give it another try when we fell short. Obviously I am invoking the developmental archetypes of Mother and Father in their ideal forms. In actuality no mother is the “perfect mother” and no father the “perfect father.” Consequently ego’s adventure through this phase of the journey is for most of us complicated by fears of abandonment, rejection, criticism – and of the failure that will surely subject us to these dreadful ends. A general insecurity drags on us like gravity, causing us to hesitate when we should better move ahead, or foolishly leap before we take the time to carefully look where we are likely to land. There can be little doubt that these developmental archetypes are beneath some of the earliest metaphors of God in religion: mother earth and father sky. In the middle of their embrace, our ancestors experienced the provident mystery of reality. Soil and fruit were gifts from mother earth; sun and rain were gifts from father sky. Life itself was sustained in the love they shared, in the way they cooperated for the provision of what early humans required to survive and prosper. Even in the Bible, reflecting a time when this divine partnership was replaced with the notion of an exclusive sky god – our Father in heaven – the maternal qualities of the earth were still celebrated in song and poetry, as Yahweh’s good and bountiful creation. As time went on, however, and a metaphysical dualism took over late Judaism and early Christianity, the earth was increasingly depersonalized and degraded into a mere resource for humans to exploit. Along with the earth, woman and the body, too, were demoted in value, regarded as the footholds of sin and death. This is where the mythic quest of Captain Ego is currently stuck, in my opinion. Because our consciousness (speaking collectively) is caught in the web of neurotic disorders – fixated on security (Mother) or overly ambitious for esteem and self-importance (Father) – we are unable to advance on the path to genuine fulfillment. Some of us have, or are in the process of making our way through this impasse. Thankfully, some of those who succeeded cared enough to return with insights and guidance for the rest of us. They passed along their wisdom, and where it hasn’t been corrupted and twisted back into an orthodoxy of world escape, sectarian fundamentalism, or redemptive violence by their so-called followers, we can find help in their teachings. This final set of archetypes I call “esoteric,” not because it is secret knowledge but rather because it involves a decisively inward turn (Greek esoterikos = inner) of consciousness. The esoteric teachings of religion take us directly into mystical spirituality, where the initiate is led along a descending path toward an experience too deep for words. In order to make the descent, ego must drop through a series of levels by letting go of the various convictions, beliefs, expectations, and attachments that give it identity, that together define who “I” am. Of course this also means that ego needs to “let go of god” – or its idea of God. In the process, theology, which is only a theory of God, falls apart and dissolves away, releasing awareness at last into the ineffable mystery of being itself, or what some mystics name “divine presence.” This divine presence is not the “presence of god,” as if the deity who was somewhere else a moment ago is now here with me. It is pure presence, the Real Presence of mystery, the present mystery of reality. This is what is meant by the “post” in post-theism, referring to the experience of presence after ego has let go of its god.